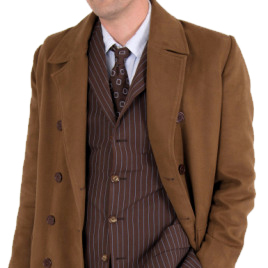 I have looked at this coat in envy and utter admiration for all the years i have both Cosplayed and seen the original on David Tennant and now i finally am able to say i have something that is as close to that original one as possible. This coat is amazing, despite it's price and how horrific it may seem, it is worth every penny. The cut, the fit, the color and just everything about it is perfect, you can run your hand along it and just know you're holding The 10th Doctor's treasured hero coat. It feels light weight so that it will flow regardless of the wind carrying or you just walking down the road but at the same time it's thick enough to keep you nice and snug in the winter.